The Breton is used for heavy draft and farm work. The breed dates back at least four thousand years. Some maintain it came from Asia and others believe it comes from smaller horses that were bred and improved by Celtic warriors on their conquest of what is now Great Britain. The Breton horse originated in France. It is used for heavy draft and farm work. It stands 15 to 16 h.h. The Breton horse has a long history with many differences in opinions. It has been said that the breed dates back four thousand years or more to the time it was brought into Europe by Aryans migrating from Asia. Others have said that the breed comes from smaller horses that were bred and improved by Celtic warriors on their conquest of what is now Great Britain. A population of horses ridden by the Celts that were probably descendants of the steppe horses were found in the Breton Mountains for many years. At the time of the Crusades, these horses were bred to Oriental stallions and mares, leading to the Bidet Breton. 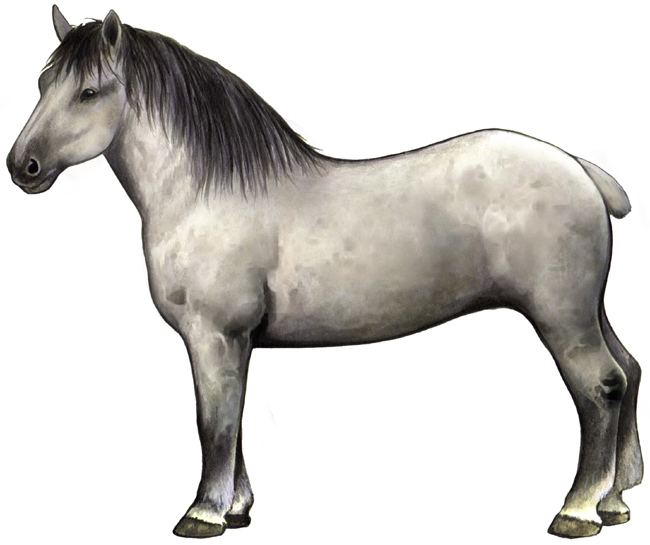 Two types of Breton horses existed at the end of the Middle Ages. They were a northern Brittany pack horse called the Sommier and the Roussin, meaning cob, which originating from the Mountain Bidet that is finer and more slender than the Sommier.